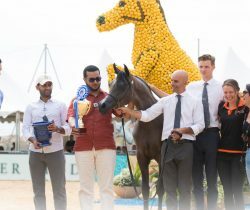 Big congratulations go to Al Sayed Stud with the Gold Champion Yearling Colt MAHER AL SAYED! Standing with Obi Training Center and shown by Arthur Nascimiento. Biggest thanks goes to #teamobi at home and at the show. Your dedication and hard work is the backbone to any success!